Do We Have A Big Situation with The Bachelorette’s Garrett? What’s that? You don’t know what the Fantasy Suite is? I’m so jealous of your life right now. Okay, quick rundown: the last three men competing for The Bachelorette (this season, Becca) travel to an exotic country, go on romantic dates with Becca, then bust uglies in a swanky hotel room. The pressure of the Fantasy Suite is real. I mean, obviously. We’re talking about busting uglies on national television here. I’ve witnessed great men crack under this pressure. But one “man” stood apart this season. He was carefree. Jovial. One would say, childlike. That’s because Garrett – the clear front runner to win this season – is no man at all. Guys, we have a Big Situation here. What do I mean by that? Simple. Garrett is a child magically trapped in man’s body after, I would assume, he stared into the magical eyes of Zoltar at a carnival and wished to be big. You’ve seen the movie, you get what I’m saying. I know what you’re thinking: Big was just a movie. (True.) Children can’t be magically turned into adults (That you know of.) Garrett might just be slow. From his online activity this is absolutely true, but he’s going to win this season, which is super depressing, so why not convince yourself he’s a child stuck in a man’s body to make it easier to accept? You want proof. Not a problem. 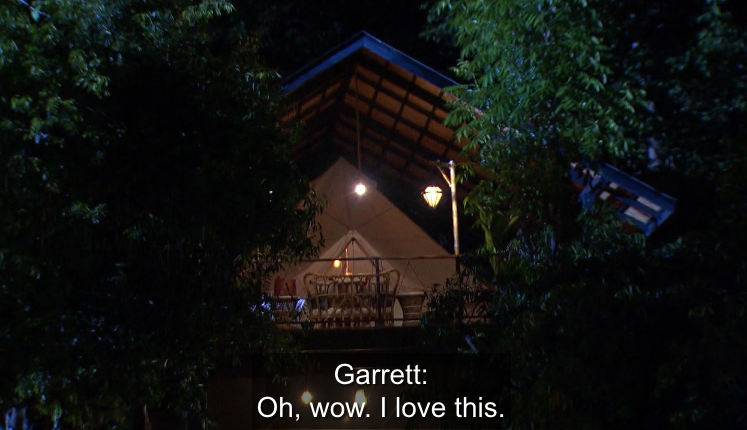 This realization hit me early in Garrett’s date with Becca after they took a raft down a river in Thailand and sat on a dock and talked about their feelings. This pre-pubescent child is sitting like he’s waiting for his mom to serve him his macaroni and hot dog chunk dinner. Straight up, that’s a child. You want more proof? Cool. But you know what’s really messed up? Becca absolutely, 100% knows Garret’s a twelve year old kid. I don’t want to get into the legality of this because that would take this “boy is seriously stuck in a man’s body and his mother probably thinks he’s been kidnapped” theory to a dark place, but oh daddy does Becca know. There were two fantasy suites in this episode. The other finalist, Blake, an actual adult in an adult’s body, enjoyed his time with Becca in a swanky Thailand resort. Very adult. Very mature. 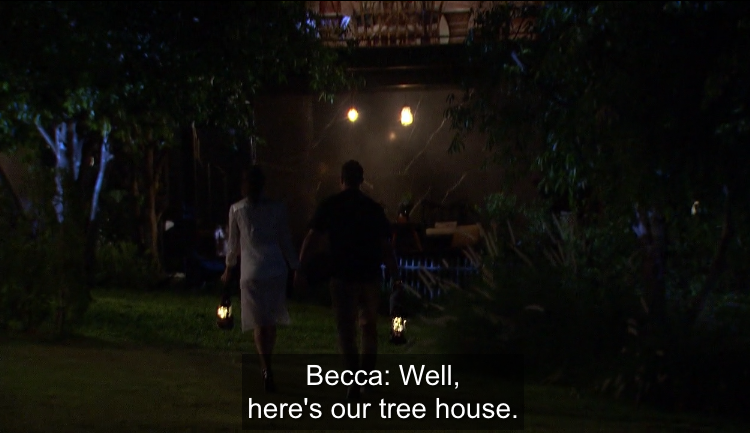 Becca knows he’s a child and she planned her overnight date with him accordingly. And you just know she packed that treehouse like a minivan ready to go on a cross country trip, full of fully-charged iPads and slime kits, and anything else that would keep Garrett occupied through the night. But maybe I’m wrong. Maybe I’m being too harsh. So let me take a step back and let Becca have the last word. Okay. We’re done here. Case closed.